A boon to the bbq set, these all-time beer classic may look like crystal but they're not. They're shatter-resistant and won't crack or break no matter how lively the party gets. A boon to the bbq set, these all-time beer classic may look like crystal but they're not. They're shatter-resistant and won't crack or break no matter how lively the party gets. Set of 4 Mugs. BEST ANSWER: Thank you for your question, yes this glassware can be personalized with initials. Please contact our consultants at 800-356-8466 for assistance on the personalization. What kind of plastic are these made from? Is it a food safe plastic? BEST ANSWER: The Indoor/Outdoor Wine Glasses are made from food-safe, shatter-resistant Eastman Tritan™ copolyester and are BPA-free/FDA-approved. These are glass but are shatter-resistant. They are definitely food safe. 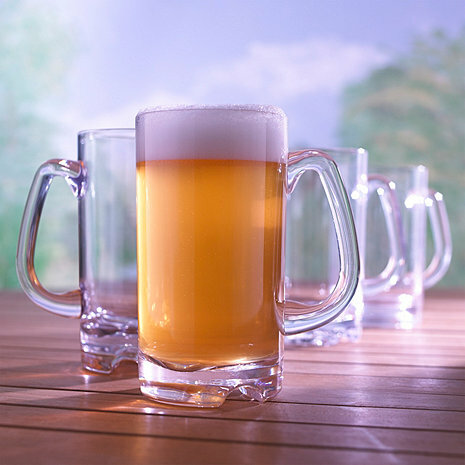 Indoor / outdoor beer mugs-- are they freezer and dishwasher safe? BEST ANSWER: Yes they are freezer and dishwasher safe. Got a set of these mugs for Christmas went on line to find these so I could have 4 more. They are great. Use them every day. I love these glasses. It is almost like it makes the beer taste better.